Tokyo's Saving-Face Olympics: but at what cost to the human race? I must admit that it didn't come as a complete surprise when I read how Tokyo's 2020 Olympic poster girl and gold medallist hopeful, Rikako Ikee, had just been diagnosed with Leukaemia. My heart goes out to her and I wish her a speedy recovery. How sad. How unfortunate and untimely for the face-saving Abe regime intent on using the 2020 Tokyo Olympics as their "Recovery Olympics" referring to the catastrophic destruction of the nearby Fukushima Nuclear Power Plant. Japan's Prime Minister, Shinzo Abe, had recently announced to the world that "the situation was totally under control and that the accident had never done and never would do any damage to Tokyo. Tokyo is the safest city in the world". You may remember the disastrous March 2011 earthquake and resultant tsunami that destroyed the Fukushima Nuclear Power Plant. This nuclear Power Plant was one the largest in the world and boasted six nuclear reactors all of which were damaged beyond repair. The molten nuclear cores of at least three of these reactors melted through the floors of their containment vessels within hours and are now unsalvageable and in contact with the ground water as they bore forever deeper into the Earth. Another of the destroyed reactor buildings is thought to be fully-laden with hundreds of highly radioactive fuel rods in a pool of water precariously stored several stories above ground. This building is rapidly deteriorating and should it collapse, Tokyo would need to be evacuated immediately. So putting Abe's comforting words aside for now let's examine what independent nuclear experts have to say regarding the fate of the Power Plant and those who lives have, or might be affected in the future: with an emphasis on independent experts as opposed to those who might gain by misrepresentation. Here we should note that Japan's Olympic Committee President, Tsunekazu Takeda, has been indicted by a French Court for alleged bribery and misrepresentation during Japan's Olympic bid. Let's start with one of Japan's most long-standing nuclear experts, Professor Koide Hiroaki (recently retired), nuclear physicist from the Kyoto University Institute for Integrated Radiation and Nuclear Science Research. In his March 2019 report Koide declares: "The Tokyo Olympics will take place in a state of nuclear emergency. Japan's Atomic Energy Agency admits the accident immediately released radiation equivalent to 168 Hiroshima bombs into the atmosphere. Cores 1, 2, and 3 melted down within hours. The total combined cesium 137 released into our atmosphere to date must be equivalent to 1,000 Hiroshima bombs. The containment of this disaster will not be achieved even after all who are alive today have died. The radiation will last for a million years". Professor Koide's report also examines how Abe's Government quietly raised the legal internationally prescribed acceptable dose of radiation a person may receive by a factor of 20: meaning that it's now okay for Japanese people and visitors to Japan to be exposed twenty times more than the rest of humankind. Meanwhile a March 2019 report by the Director of Fairwinds Energy Education, Arnie Gundersen, points out how instead of focussing on the mitigation of the radioactive exposure, "the Abe Government has sought to re-direct world attention to the 2020 Olympics instead. The triple meltdowns are the worst industrial catastrophe that humankind has ever created. The three molten radioactive cores are now in direct contact with groundwater these past eight years and then that highly toxic radioactive water enters the Pacific Ocean". "We took simple dirt and dust samples along the Olympic torch route as well as inside Fukushima's Olympic stadium and as far away as Tokyo. When the Olympic torch route and Olympic stadium samples were tested, we found samples of dirt in Fukushima's Olympic Baseball Stadium that were highly radioactive, registering 6,000 Bq/kg of Cesium, which is 3,000 times more radioactive than dirt in the US. We also found that simple parking lot radiation levels were 50-times higher there than here in the US". In a recent YouTube video by ex-Japan Times editor, Yoich Shimatsu, you are taken on a tour of Tokyo Harbor and other highly radioactive locations close to the destroyed Fukushima Nuclear Power Station. In this video Shimatsu points out various Olympic venues, and with his Geiger counter in one hand and camera in the other he gives viewers live on the spot readings of the high levels of radiation there. He also points out several Olympic venues under construction that have used radioactive contaminated soil in their foundations that was transported directly from the Fukushima exclusion zone which is a mere 150 kilometers away. So considering all the above and more that space won't permit here, I am left wondering: is Abe's insistence that all is well in Tokyo and Fukushima just about saving face or are there others factors at play here? Yes, much is about profits as Ernie Gundersen explains so well in his report featured above. But allow me to introduce another ingredient into this hemlock laden witches brew - a brew personifying all that this evil in the never ending battle between the forces of good versus evil, as portrayed in Shakespeare's occult play, Macbeth. Let's start with Shinzo Abe, Japan's Prime Minister for most of the eight years since the Fukushima catastrophe. What other factors could possibly be driving him to insist on taking Japan down such a treacherous nuclear path - both energy-wise and militarily? The answers might have their origins going back two generations starting with his grandfather, Nobusuke Kishi. Kishi is a Class A sentenced-to-death war criminal. Like many such war criminals he was released, thereby escaping execution, by a special arrangement with the US in a "scientific" information exchange. Kishi was Japan's war-time Armaments Minister and head Administrator of Japanese-occupied Manchuria (near Harbin in N E China). Here and under his command thousands of Chinese civilians and military personal were imprisoned and forced to work as slaves in coal mines, Japanese owned factories as well as being used as live guinea pigs in secret medical experiments. Thousands perished in the most humane manner imaginable. It was here and under Kishi's command that the notorious and secret Unit 731 was established wherein they experimented with and developed all kinds of weapons of mass destruction, including biological and chemical weapons - often using live Chinese people as guinea pigs. Meanwhile Shinzo Abe's father, Shintaro Abe, has been named on at least two occasions in both the Japanese parliament and in independent news agencies as being the main sponsor and financier of the apocalyptic and murderous religious cult - Aum Shinri Kyo - the one that tried to murder thousands of Japanese subway commuters in downtown Tokyo by using Sarin gas. The battle-cry of this cult is - The earth must be destroyed in order for us to save it. Shinzo Abe, like his father Shintaro Abe, is also named by independent news agencies as being implicated in the sponsoring and financing of the occult Aum Shinri Kyo apocalyptic cult. So where do I go from here? Should I go to the Tokyo 2020 Olympics or not? I have two choices - the red pill or the blue pill. Firstly do I accept Prime Minister Shinzo Abe's account of radiation levels in and around Tokyo and the Olympic venues? Should I believe a Prime Minister cursed with the genetic imprint of a Japanese war criminal/mass murderer and son of an ultra-right wing father who abides by an apocalyptic ideology? Or should I place my trust, and health, in the hands of independent, qualified nuclear scientists such as Professor Koide Hiroaki and Arnie Gundersen? "Those people and countries who will participate, will, on the one hand, themselves risk exposure and, on the other hand, become accomplices to the crimes of the nation". Professor Koide Hiroaki. 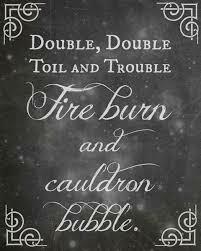 "Double, double, toil and trouble. Fire burn and cauldron bubble" sing Shakespeare's wicked witches as they add hemlock to the brew - a brew personifying all that is evil.